According to the official 9/11 Commission Report, the Flight 77 was 5 miles (8.0 km) west-southwest of the Pentagon when, it made a 330-degree turn. At the end of the turn, it was descending through 2,200 feet (670 m), pointed toward the Pentagon and downtown Washington. Boeing 757-223, flying at 530 mph over the Navy Annex Building adjacent to Arlington National Cemetery, crashed into the western side of the Pentagon. 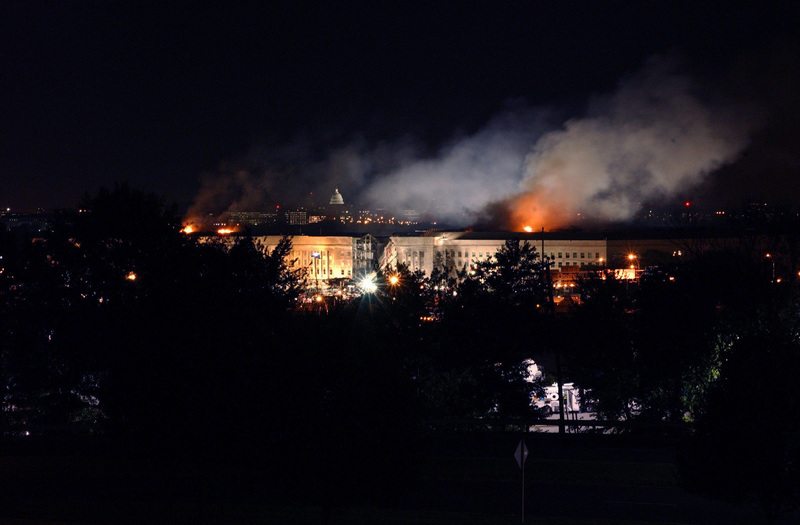 The plane hit the Pentagon at the first-floor level, and at the moment of impact, the airplane was rolled slightly to the left, with the right wing elevated. The front part of the fuselage disintegrated on impact, while the mid and tail sections moved for another fraction of a second, with tail section debris penetrating furthest into the building. In all, the airplane took eight-tenths of a second to fully penetrate 310 feet (94 m) into the three outermost of the building's five rings and unleashed a fireball that rose 200 feet (61 m) above the building.